I saw this same fabric and almost bought it, but did not for some reason or another. Your dress is beautiful. 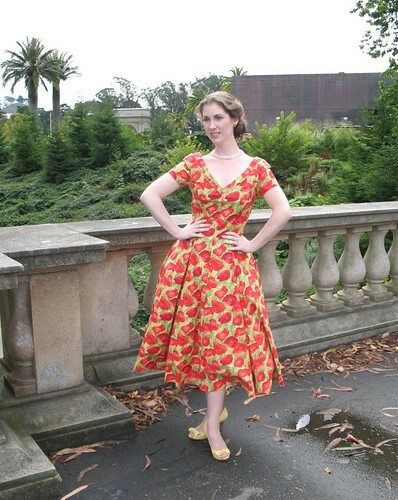 Your frame really lends itself to tea length dresses, which not everyone can pull off. Again, very lovely. This is simply stunning! Can't believe you found that lovely fabric at Joann's! @Carolyn (cmarie12) Carolyn - I couldn’t believe my luck, either. It was a few years ago, though, and I have not had much success with their fabric recently. I get so disgusted with all of the polyester fleece that I tend to avoid the fabric section altogether, when I should take the time – you never know when there will be a treasure hidden amongst all the junk! How fabulous you look in that beautiful dress. 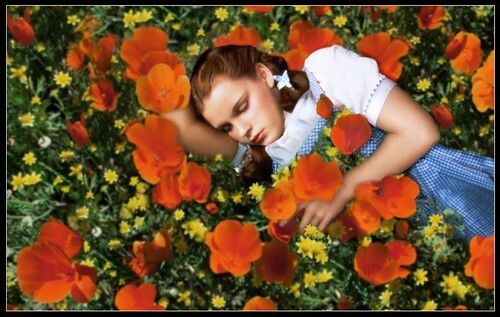 The poppy field fabric is perfect and a great color combination on you. Love the yellow shoes also. Le tissu sied à merveille à la forme de la robe qui elle même vous va à ravir. @Anonymous Encore, merci! J’adore la langue française – mais je ne parle pas bien. I think I will leave it at that before I butcher your language! “époustouflant” – what a fabulous word, and one that I will admit necessitated the use of my French dictionary! I am going to have to add that one to my vernacular! I am so impressed with this dress. You look stunning in it. I am on the mission to make this dress for my wedding. I am on my "practice" now. I have never encountered a pleat where the stitch extends above the pleat. Do you remove that? I am afraid you will be able to see the extended stitch line. Any words of wisdom about this dress would be lovely. This will make a fabulous wedding gown! The pleats are basted, so yes, those stitches are removed. I would recommend playing around with some fabric scraps. Silk thread is generally much better for basting because it will pull out smoothly. If you are working with a white fabric, I would use white thread (there is always a possibility that colored thread may deposit color). Use the smallest needle you are comfortable with so it doesn't leave large holes in the fabric. Again, use your test scraps to make sure that a quick steam will remove any obvious holes. Another possibility (not sure how much time you have!) would be to embellish those basted areas with beading or embroidery to disguise any stitch lines. If you do go that route, just make sure that stitching those areas will not effect the flare of the skirt if you are planning on using a large petticoat! Have fun! It really is a lovely pattern. Thank you for your advice! 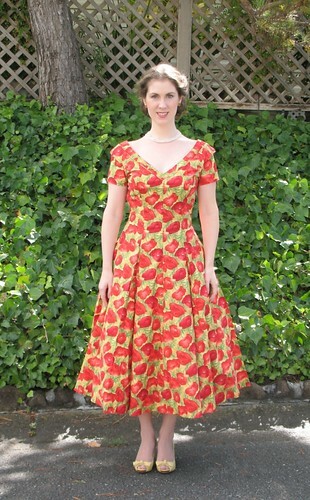 I am making a "test" dress right now with some other cotton fabric for a day dress. I plan on using a shantung for the actual gown. I was wondering if you mind me asking for a bit more information on the 'baste pleats' instruction? Is this just to assist the pressing (which I think it is) and you remove the stitches later but the little line of stitching above the pleat is permanent? It's not something I've been able to work out from the illustrations or instructions... And I think that's what you're saying to RockabillyKitten in your answer above? Also, with the sleeve insertion, did any part of the armhole end up being un-sewn or were you able to get the underarm stitching meet the sleeve stitching on the yoke? Petticoats really are fabulous, aren’t they!? You are absolutely correct in assuming that all of that basting is to keep the folds in place until they are pressed into submission. There is no need to keep any of the stitching in once your construction is finished. Rockabilly Kitten was worried about the basting stitches and needle holes leaving a mark (bridal fabric is especially prone to these kinds of issues) but if that will not be an issue, I would remove the entire line of stitching. The sleeve/yoke portion of the pattern is a bit tricky, as I recall. The top of the sleeve gets applied to the yoke, slipped into place, and then the underarm is sewn to the dress. Those two stitching lines should meet at both ends, although the seams will keep you from completing the circle, and you will have to push the extra fabric from the opposite seam out of the way. The construction of a gusset poses a similar problem. The trick is to stop stitching at the perfect spot, so you have a finished seam, but do not catch any extra bits of the sleeve or yoke fabric. I am not sure that is any clearer than the instructions, but I hope it helps! Thank you! That's what I'd interpreted, but it's always nice to have someone who's also followed the instructions 'read' them the same way! You look fabulous! 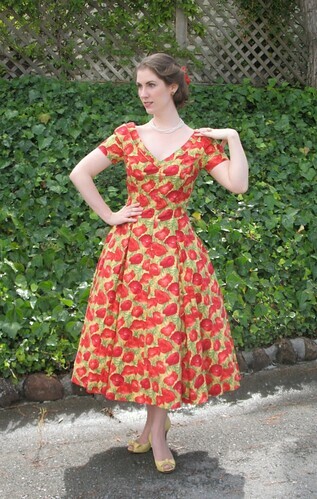 I've just started to make this dress and I really hope I look as good in mine as you do in yours! I'm loving your coat too :-) And thank you for explaining a bit more about the basting on the pleats - I was puzzling over this but now I think I understand! This is beautiful! 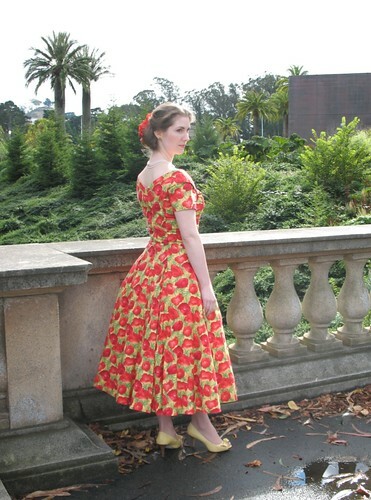 I stumbled across this blog because I wanted to see what other people did with this pattern, and I wonder...do I *have* to have a crinoline with these type of dresses? I re-enact other time periods so know underpinnings are dead essential to meaning anything look right -- for the time. 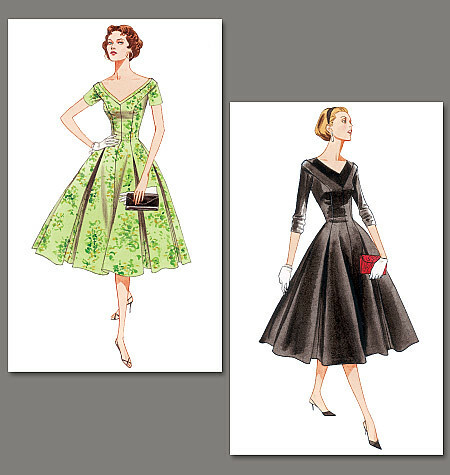 But I want to make these dresses and wear them to work, and thought maybe skipping the crinoline (and probably shortening the skirt, then? I assume no crinoline would make the skirt a lot longer?) would make it look less...jarring to the modern eye? Underpinnings are certainly going to change the overall look of a dress like this, and it is absolutely wearable without them. A petticoat is going to raise a hemline a bit, but not dramatically, especially with a mid to heavy weight fabric. And I think this design is extremely classic, so depending on fabric choice and styling, I would imagine it would fit into a modern wardrobe quite well! Good luck and happy sewing! A year later I'm asking a question. Could someone please measure the finished edge of this V2903 dress? 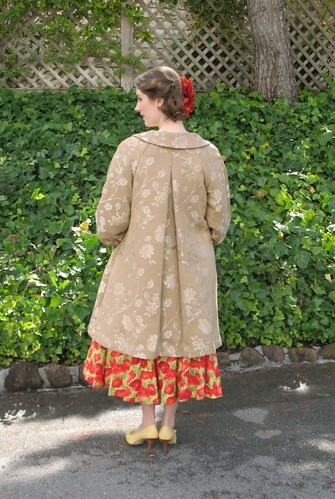 I need a seriously full skirt for a 50's musical. Online pattern didn't seem to indicate. I would be so so grateful!